Additional features of this growing fan-based event are over 200 specialty shops. Craftsmen may also promote their products by giving demonstrations. Items are varied with a huge selection of original artwork. Such as candles, children’s toys, jewelry, and period musical instruments. How to get in on the fun?! Just as any major venue you may check local tourists attractions listings or search via the internet. Don’t forget to check your local grocery, military, senior, or travel coupon book for discounts. If going as a group don’t forget to call the Fair directly and ask for your organization’s discount or consider purchasing consignment tickets! Depending on your location you may have to drive a bit out of your local metro area. These fairs usually take up a lot area, being that they have to house animals, volunteers, vendors, as well as guests. This fair is usually over a weekend some people forget and go only one day when they have paid for 3. To get more bang from your ticket set aside time in your schedule to plan accordingly. Most of these fairs are open even on rainy days, so in the case of inclement weather dress accordingly! Again as in most venues this size, there are usually handicapable ramps or other provisions that make mobility easier. Check with the fair directly for any particulars you may need for your visit. Scooters, wagons, or wheelchairs are usually available on a first come first serve basis. When in doubt bring your own. Scarborough Fairs are THE place to drink alcoholic beverages! There are many pub and hubs to try new and old favorites. Craft beers, frozen beverages, wine, and my favorite mead is in abundance! You must be 21 years of age in most States in America to purchase alcoholic beverages. All beverages must be purchased and consumed at the Fair. And no, you can not bring your own. So, you are now ready to enter into the world of the Renaissance. What do you wear? There are 3 basic pseudo-personas that enjoy this event and what they wear. Average Guy persona-Whatever shorts and shirt they usually wear to a picnic…this is what you will see. They will soon find out that they are the odd ones dressed this way. 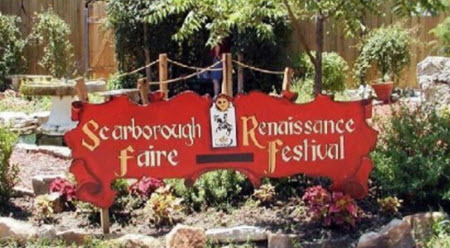 These people always wear designated Scarborough Fair T-Shirts for “comfort”. I just don’t want to look weird, but I am comfortable enough to wear their t-shirt. I’m really too tired to wear anything else. My real costume is still lost at the airport…(Yes, people fly in for this fair!). You have arrived and ready to play! You have a “connection” with the event and the Fair Folk. You are ready to sign up as a seasonal character. Secretly, you wear them at home or visit hospitals for sick children. Will leave off why one would secretly wear the costume at home. Weapons-To complete the look of some costumes…many have weapons that make them more authentic or may show off their creativity in the creation of weapons out of various materials from paper to purchasing the real deal. If you happen to have the “real-deal” you may find that your local Fair prefers that its patrons not use weapons as an accessory to your costume. But being that is usually a venue that most patrons enjoy participating in with relish,…many choose to bring and wear them. If the weapons are real and functional or if the safety patrol considers them as functional they must be peace-tied.so that it can it will reduce the chances of an individual being cut, the weapon being drawn, or wielded while on the Fair’s premises. With the growing number of participants. The Fair’s Security may enforce this infringement so, play close heed to their rules. If not, they may confiscate the weapon and expel the violator from the Fair’s premises. What to do and look for? Remember you got more than 150 acres to cover! Is it that big? Oh, yes! And look at the following things you are your entourage can enjoy! Grande Parade, Children’s Knighting Ceremony, Human Chess Match, Renaissance Rides, Games of Skill, and much more! Just want to take it slow and savor the sights? Check below! Most have more than 200 craft shops feature unique handmade wares made by artisans from around the country. Jewelry, clothing and fashion accessories, metal works, pottery, leather goods, toys, games, candles, soaps, musical instruments, whimsical and fine arts and woodworking just to name a few. Each day, artisans demonstrate ancient crafts such as Glass Blowing, Blacksmithing, Candlemaking, Printing on a Gutenberg Press, leather crafting, pottery, broom making, Armor tooling, coin minting, jewelry making and more. Daily Beer and Wine tasting. You indeed need and an entire weekend to see it all! Consider having a Renaissance Birthday, Wedding, or contact the venue for interest as a volunteer actor. One weekend of fantasy may change your reality!